By Richard K. Vedder, Foreword by Chester E. Finn, Jr. Despite more than 15 years of effort, it is widely acknowledged that internal reform of the public schools has produced little, if any, success. This has led to renewed interest in alternative forms of educational delivery to devolve decision-making through charter schools, public and private voucher plans, contracting out educational services, and home schooling. However, such reforms have largely been resisted by public school interest groups, including teacher unions, state departments of education, colleges of education, and school board and administrator organizations that have fought any but the most benign changes. Less attention has been given to another option that has been quietly growing in importance: private, for-profit schools. Firms in the private sector are typically more productive and responsive to consumer demands than their public sector counterparts. Can Teachers Own Their Own Schools? examines the economics, history, and politics of education and argues that public schools should be privatized. Privatized public schools would benefit from competition, market discipline, and the incentives essential to produce cost-effective educational quality, and attract the additional funding and expertise needed to revolutionize school systems. Drawing inspiration from Margaret Thatcher’s privatization of government council housing in England, privatization reforms in Latin America, and the E.S.O.P. 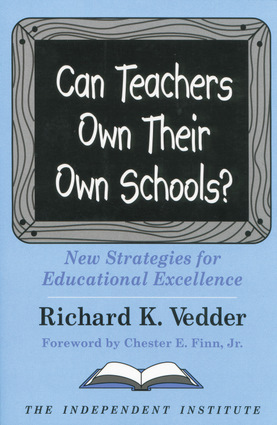 (Employee Stock Ownership Plan) movement in the United States, Vedder presents a bold plan in which teachers, administrators, and others involved in the educational process would become the owners of schools, acquiring an attractive financial stake in the process. Such privatization reforms could pave the way for new, cost-effective means of improving educational outcomes. As a result, schools in which teachers, administrators, and parents have a significant financial stake would foster vibrant school communities with increased parental involvement and the innovation and efficiency essential to produce educational excellence. Richard K. Vedder is a senior fellow at the Independent Institute and Edwin and Ruth Kennedy distinguished professor of economics and faculty associate, Contemporary History Institute, Ohio University. He is the coauthor of Out of Work: Unemployment and Government in Twentieth-Century America. Professor Vedder received his Ph.D. in economics from the University of Illinois, and he has been senior economist at the U.S. Joint Economic Committee and visiting fellow at the Center for the Study of American Business, Washington University, and he has taught at the University of Colorado, Claremont Men’s College, and MARA Institute of Technology. His hundreds of articles and reviews have appeared in numerous scholarly journals as well as such publications as the Wall Street Journal, Christian Science Monitor, National Review, Washington Times, and Investor's Business Daily. He lives in Athens, Ohio.